Early on the evening of Nov. 17, Lucas Oil Stadium throbbed with the music of popular Catholic music artist Matt Maher while youths rushed to get near the stage on the center of the stadium’s floor. Further out on the floor, multi-colored lights flashed back and forth while youths danced in long conga lines, giving high fives and free hugs to perfect strangers in a joyous expression of faith. Later that evening, though, the cavernous stadium quietly echoed with the centuries-old Gregorian chant sung by Benedictine monks of Saint Meinrad Archabbey in St. Meinrad and participants in its One Bread One Cup youth liturgical leadership program. Then the stadium was enveloped in a deep, prayer-filled silence as more than 20,000 youths and adults adored the Blessed Sacrament exposed in a monstrance on an altar on the stage. 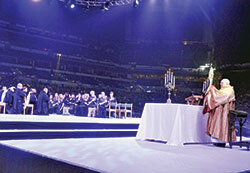 Father Joseph Espaillat II, a priest of the Archdiocese of New York who served as an emcee of the conference’s general sessions, blessed the thousands present with the Blessed Sacrament in solemn benediction. The monks and One Bread One Cup youths also led the conference participants in praying Compline, also known as Night Prayer, from the Liturgy of the Hours, much as such liturgies occur in the monks’ Archabbey Church of Our Lady of Einsiedeln. The liturgy concluded as the monks and youths processed to a statue of Our Lady of Fatima where they and all in the stadium chanted “Salve Regina” (“Hail Holy Queen”), an ancient antiphon that praises the Blessed Virgin Mary. Benedictine Brother John Mark Falkenhain spoke afterward about leading 20,000 youths into silent prayer and a quiet chanting of psalms in the Liturgy of the Hours. Brother John Mark also reflected that the monks benefited from the example of the youths at NCYC. Other youths in Lucas Oil Stadium on Nov. 17 were drawn into the atmosphere of prayer created by the monks and One Bread One Cup youths. Beth Wimsatt, a member of St. Mary-of-the-Knobs Parish in Floyd County, also valued the silent prayer. Tammy Becht, a member of Our Lady of Perpetual Help Parish in New Albany, has seen many youths enter more deeply into the Church’s rich liturgical tradition in her ministry as director of One Bread One Cup. Since it was started in 1995, more than 4,600 youths from more than 40 dioceses have participated in One Bread One Cup. Witnessing 20,000 youths enter into quiet, prayerful liturgy in one night was powerful for Becht. “I have a cold chill all over myself right now,” Becht said moments after the evening session ended. “When I think about [20,000] people in this stadium, with the Blessed Sacrament exposed, and not a sound came from any place—it was complete silence. One of the youths who has given his heart to the Lord that helped lead the liturgy in Lucas Oil Stadium was Nolan Snyder, a member of St. Boniface Parish in Fulda, a few miles from Saint Meinrad Archabbey. A high school senior and four-time One Bread One Cup participant, Nolan gave a reflection in the stadium about eucharistic adoration, something that he had difficulty appreciating until he had a special experience in the summer of 2016 at Bishop Simon Bruté College Seminary in Indianapolis. In that moment, he was given a powerful awareness of the presence of Christ in the Eucharist. He then invited all present in the stadium to enter into the silent prayer that was about to begin. That prayer was answered for Noah Tyler, 17, an NCYC participant from Lake Charles, La., who said that the time of adoration was “the climax” of the conference for him.